An ingrown toenail, also knows as unguis incarnatus or onychocryptosis, is a common and painful toe condition where the edges or sides of the nail grow into penetrating the flesh of the toe. The pain is normally followed by swelling and redness. An ingrown toenail occurs most often in the big toe and it is a common result of shoes that don’t fit, improper nail care or injury. Often, an ingrown toenail can be treated at home by soaking the foot in warm water, wearing loose footwear like sandals, using over-the-counter pain medication, and attempting to lift the edge of the ingrown nail. However, an ingrown toenail can cause complications and severe pain that might require immediate medical treatment which normally include surgery. The risks of complications from a toenail are higher for patients with diabetes or different conditions that cause poor circulation. 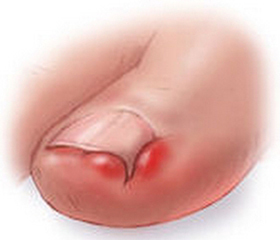 An untreated ingrown toenail can lead to an infection or even an abscess. If that were to happen, surgery will be required. During a ingrown toenail surgery, the infection or abscess is drained through the end of the toe while all extra tissue that grew around the nail is removed. Matricectomy is a procedure where all or part of the base nail portion (nail matrix) is removed by using chemical, electrical, or surgical means. There are two types of Matricectomy: complete and lateral matricectomy. During a complete matricectomy, the entire nail matrix is removed resulting in permanent nail loss. A lateral matricectomy is the surgical removal of a portion of the nail bed. During a nail ablation, the ingrown toenail is cut along the corner and pulled out Then, the surgeon will apply a small electrical shock or a liquid solution to the exposed part of the nail bed in order to prevent the regrowth of a toenail again.